At Hugsy we develop comfort and care products that give children the feeling of being close to their parents. Our designs are evidence based and clinically tested and provide young children with their parent's unique heartbeat, soothing smell, and feeling of support. The Hugsy Home Care line features 3 products: the Hugsy Heartbeat, the Hugsy Pouch, and the Hugsy Cuddle - to meet the needs of children aged 0-4 years old. 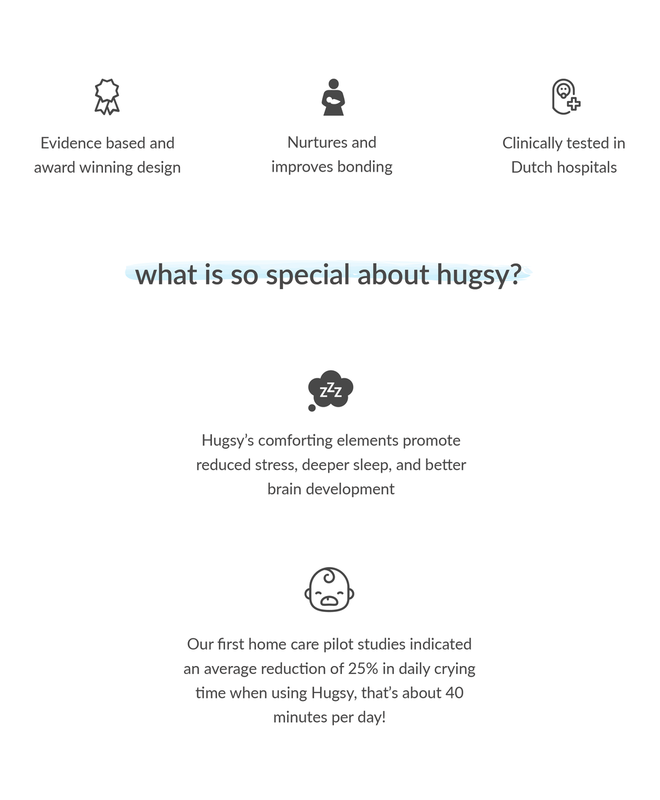 The Hugsy Pouch is a snug swaddling blanket used to support kangaroo care cuddle sessions, and prolong the benefits even when you can't be near. The organic textile absorbs your scent when cuddling, and together with the Hugsy Heartbeat, provides your scent, heartbeat, and feeling of support in the crib. A product for older babies and toddlers that keeps your little one nice and comfortable. The detachable body can be used as a scent-cloth, and the Hugsy Heartbeat fits snuggly in the little bear's head. Provides your soothing scent and heartbeat 24/7. The Hugsy Heartbeat is a smart heartbeat recording device. Just put the finger sensor on during a relaxed moment, and the Hugsy Heartbeat records your heartbeat, and then reproduces your unique heartbeat sound and vibration for your little one. We're working hard to get our products on the market as soon as possible. If you are interested in products like ours, we'd love to add you to our growing list of interested customers. We promise not to send you any spam - we simply like to measure the interest! All we will do, is shoot you an email as soon as our products are ready for purchase.